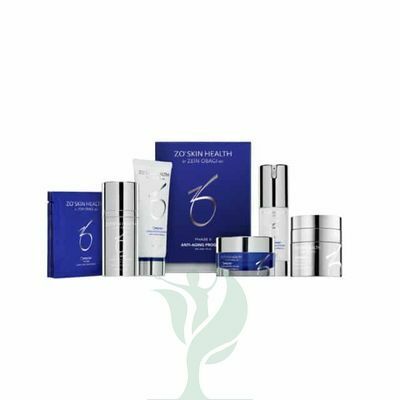 ZO® PHASE 2: ANTI-AGING PROGRAM is an anti-aging skin care regimen with six products: ZO® OFFECTS® EXFOLIATING CLEANSER, ZO® OFFECTS® EXFOLIATING POLISH, ZO® OFFECTS® TE-PADS ACNE PORE TREATMENT, ZO® OSSENTIAL® DAILY POWER DEFENSE, ZO® OSSENTIAL® GROWTH FACTOR SERUM PLUS, and ZO® OCLIPSE® SUNSCREEN + PRIMER SPF 30. These skin care products contain ingredients such as salicylic acid, glycolic acid, and small particles to help exfoliate skin and stimulate skin cell growth, as well as ingredients such as retinol, peptides, roxisomes and ultrasomes, Matrixyl 3000, glucosamine, and plant stem cells to help reduce the appearance of fine lines and wrinkles and antioxidants to help prevent future damage. Doctors such as plastic surgeons and dermatologists may recommend ZO® PHASE 2: ANTI-AGING PROGRAM to their patients between the ages of twenty-six and forty-four. These patients may already have early or significant signs of environmental damage and aging, and they want to help reverse their signs of aging such as fine lines and wrinkles while helping prevent future damage. ZO® PHASE 2: ANTI-AGING PROGRAM works by exfoliating the skin, clearing pores, stimulating skin cell renewal, and protecting skin from sun damage. The texture of and ingredients like salicylic acid and glycolic acid in ZO® OFFECTS® EXFOLIATING CLEANSER, ZO® OFFECTS® EXFOLIATING POLISH, and ZO® OFFECTS® TE-PADS ACNE PORE TREATMENT help to both physically remove dirt and oils from the skin but also chemically exfoliate dead skin cells from the surface, stimulating the growth of new skin cells that are less affected by environmental damage. The skin care products also contain antioxidants which help trap free radicals, reducing the chance they will cause damage. ZO® OSSENTIAL® DAILY POWER DEFENSE and ZO® OSSENTIAL® GROWTH FACTOR SERUM PLUS contain ingredients to help firm skin and improve elasticity, such as retinol, Matrixyl 3000, ultrasomes and roxisomes, plant stem cells, glucosamine, and peptides. Finally, ZO® OCLIPSE® SUNSCREEN + PRIMER SPF 30 contains titanium dioxide to filter UV rays from the sun, reducing the chance of sunburn and other damage. Together, the ingredients in ZO® PHASE 2: ANTI-AGING PROGRAM help cleanse and reduce pore size, reduce the look of fine lines and wrinkles, and protect skin from environmental damage.